We’ve always got time for a horror-themed online slot so here’s one more to add to an ever-extending list. It’s called Monster Cash and it’s developed by Inspired Gaming, the company which supplies Virtual Sports games for Bet Victor Casino. Monster Cash is full of bonus features and a progressive jackpot so keep reading for more information. 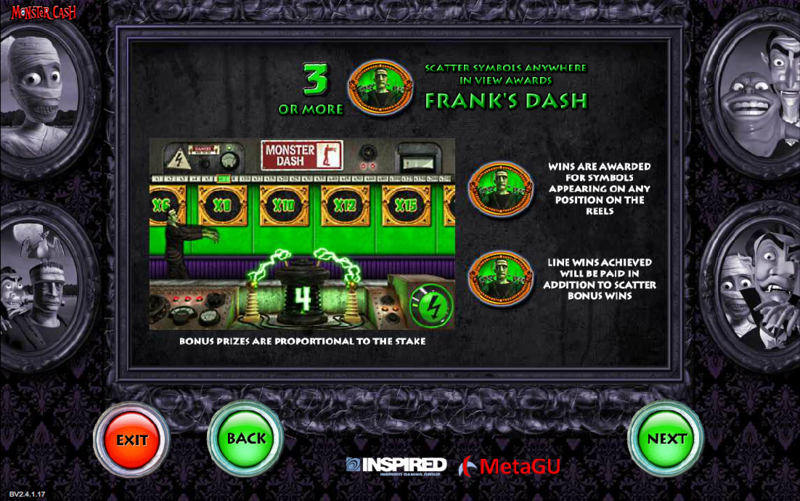 Monster Cash is a five reel slot with three rows and up to twenty paylines; it’s all set in a spooky graveyard at night where famous Victorian creations such as Frankenstein’s monster, Count Dracula and a Mummy roam among the tombstones. There are just three high value symbols – two bat-like gargoyles and the Monster Cash logo while 10, J, Q, K and A represent the lower values. 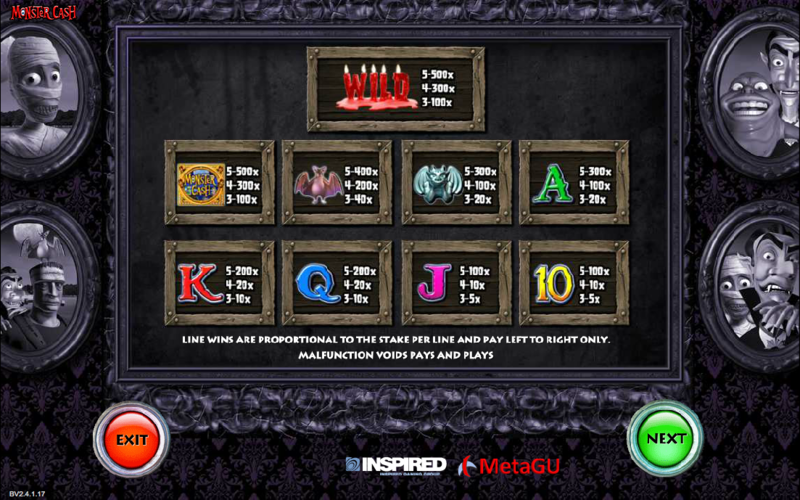 The wild symbol is formed by a number of burning candles and then there are four scatters – the Mummy, Frankenstein’s monster, Count Dracula and the Spooky Spins ghost – al of which activate bonus games. Three or more of the Mummy scatter symbols anywhere in view will trigger this feature. On the screen shown all you have to do is select a grave on the left for a cash prize and then a coffin on the right for a multiplier. This is quite good fun and triggered by landing three or more of the Frankenstein scatters anywhere in view. Just press the green button and the monster will move a certain number of places along the multiplier scale. Keep going and increasing that multiplier until you hit the big red ‘X’ which ends the round. Make it to the end for 160x your total bet. More spins can be re-triggered by landing more scatters within this round. You can see the ‘Drac’s Cash’ progressive jackpot total in the top right hand corner and the way to win it is to land five Dracula scatter symbols anywhere in view. There is no minimum wagering requirement to take part in this competition. Everything is triggered by scatter symbols so low rollers can play in the knowledge that just one payline active has the same chance of activating the bonus games or winning the progressive jackpot. 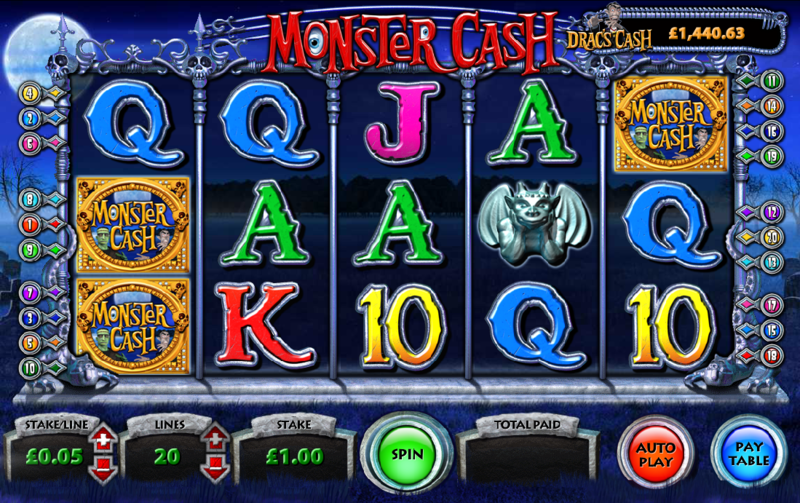 Monster Cash is a pleasure to play with it’s regular lightning strikes and Munsters-esque music creating the atmosphere. Loads of bonus features and a progressive jackpot finish things off nicely.